Android users have a limited number of home screens on their phone (3 to 5, depending on what version you use), but folders group your home screen shortcuts into quick pop-up menus. For example, I’ve got a few specific things I use on my phone when I go to the gym: a workout music playlist, a stopwatch app, my gym locker combination, a bookmark to an exercise program I’m following, and an app that tracks how far I’ve run. I only use these shortcuts when I’m at the gym, so I’ve put them all in a folder called “Gym,” as shown here. When I get to the gym, I plug in my headphones, tap that folder, and everything I need to work out is there. 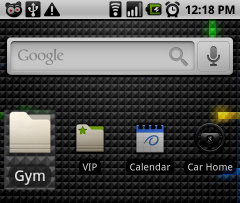 Here’s how to create folders on your home screen to organize your Android icons. A folder called “Folder” will appear on the desktop. Tap to open it. 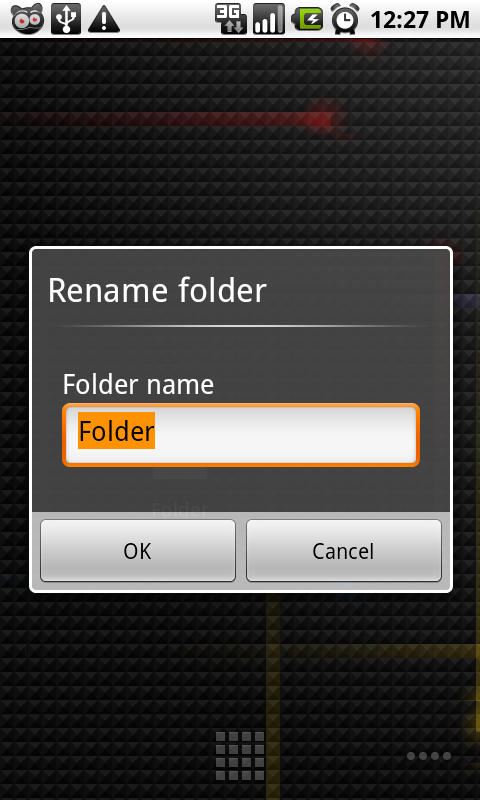 Then, tap and hold the folder’s header to rename it, as shown. (I called mine “Gym.”) Tap Ok.
From there, close the folder and drag and drop any applications, playlists, contacts, or shortcuts to that folder. So, while you don’t have unlimited home screens in Android, you do have the ability to create home screen folders–which is nice for place/context-specific icon groups, because you can name them. You’ll see in the second screenshot that there are lots of other folders you can add to your home screen; I’m a fan and user of the Starred contacts folder as well. Never thought of using these for apps for specific locations. Gina…thinking outside the box as usual. Thanks! 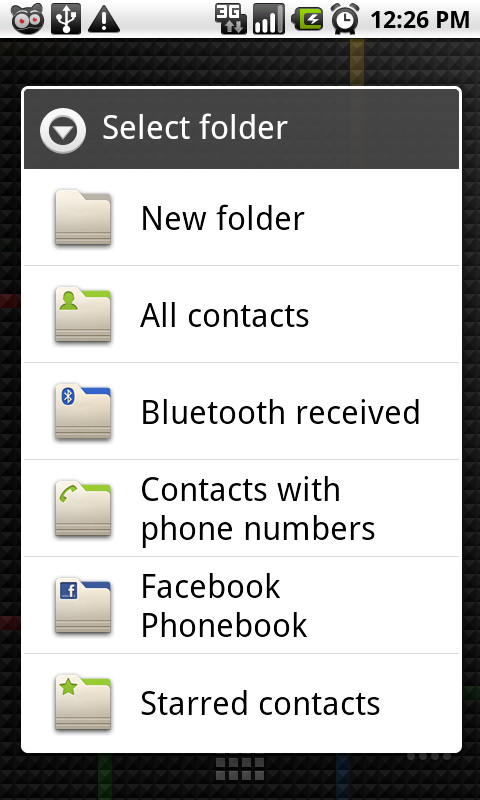 Even on my Hero, which, thanks to HTC Sense, has 7 home screens, I’ve found it useful to use folders on some of the screens. I’m not a big games player, but I have too many to fit on the screen, so I use a folder. There are just so many good apps out there, and I don’t want to have to go through the apps list to find them. HTC Sense also supports “scenes”, which are saved desktops. I started out configuring different combinations of apps for different situations, but I’ve tended to stick with one scene that fits all my needs. Perhaps if the scenes menu provided an easier way to “save and replace” an updated scene, I would switch scenes more often. I find that Apps Organizer helps with this too. You can also change the look of the icon if you find the default folder too drab and boring. You can also download tags for your apps if you can’t be bothered to sort them yourself. Another alternative would be the app Apps Organizer, where you can assign labels / tags for applications. By adding the Apps Organizer to a screen you can select which label should be used (also favorites or starred apps) and then all apps with this label will be shown. Pro: you can assign multiple labels to an application and the opened folder can be autoclosed after starting an application. Folders are great, however they have an achilles heal worth mentioning. When you open a folder and click on an application or contact or whatever, you would expect the folder to close after selecting something. 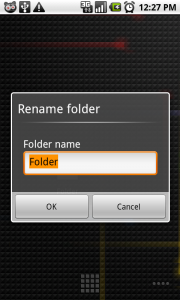 Unfortunately, after selecting an item in a folder, you have to return to that home screen, and manually close the folder yourself. For this reason, I use AppsOrganizer, as it automatically closes a folder, once an item within that folder is selected. 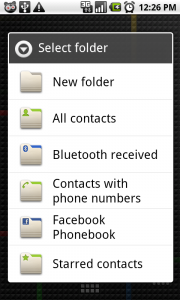 One thing to keep in mind is that widgets won’t go into folders. I was a little disappointed to realize that my “settings” folder to hold the quick access toggles for Wifi, GPS, BT and Data wasn’t going to work. It’s much better than using folders. This app lets you assign labels to apps. (Think GMail style) This is nice because apps, bookmarks, and contacts can have multiple labels. Then, you can put label shortcuts on your desktop instead of folders. They operate the same, but better in certain ways. Assigning labels to apps is easier. Select a label, and get a checklist of your apps and just check everything that you want to belong to this label. When you edit these, your changes propagate to your desktop label shortcuts automatically! It’s SO much easier than dragging icons into folders, and easier to edit. The shortcuts on your desktop are really more like live searches. And you can sort items within labels with several criteria…name, last used, most used, starred. I have a label called Frequently Used on my home screen that is just all apps sorted by Most Used. It’s fantastic. @Jeff: thanks for the recommendation. You’re right, the ABC Organizer is way more useful as you can extend the shortcut folders also to bookmarks and contacts and the sorting functionality is way more advanced. There exists also a light version, but paid for the full version. Gina what did you do to make the locker combo? Is that just a contact dragged into the folder? @tenkely: Yep, the locker combo is just a contact. So is wrangling them in folders better than just having them all over your homescreen memory wise? @Gina Thanks, can’t wait to retire (aka pass on to my wife) my MyTouch and pick up a Nexus One… someday.